Students from Weaver School took part in Kids Day at UC Merced. The event was part of Engineers Week. UC Merced hosted sixth- through eighth-graders from Weaver School as part of Kids Day during Engineers Week last month. Students rotated between three STEM-related stations — creating volcanic eruptions using acid-based chemical reactions, producing solar circuits, and touring Central Plant and underground tunnels on campus. The event ended with a panel led by UC Merced students, who discussed STEM fields and ways to pursue innovative professions such as engineering and science. Kids Day was led by junior Ethan Murcia and organized by Vanguard Engineering Society, the umbrella organization of the School of Engineering that houses student chapters for engineering professional organizations. The university’s STEM Resource Center and Young Engineer and Scientist (YES) Academy also contributed to the event. A slideshow of images from Kids Day. YES Academy is an outreach program by the STEM Resource Center and the UC Merced Fresno Center Office of External Relations. 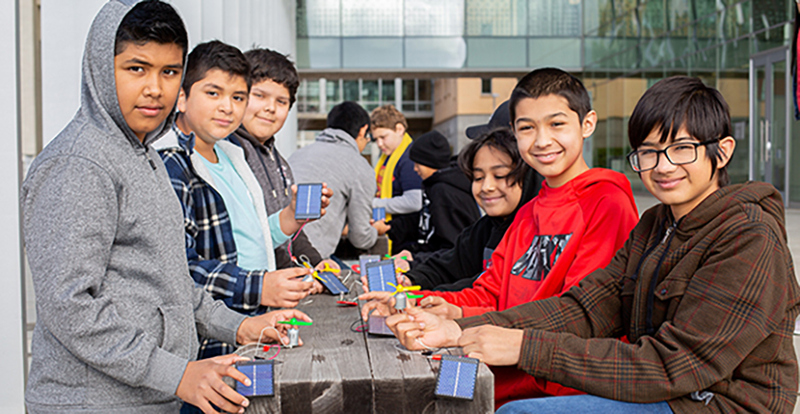 The group hosts workshops at schools throughout the county to introduce students to STEM careers, but Kids Day event was the first full-scale event held on UC Merced’s campus. Engineers Week ran from Feb. 18-22. Events on campus throughout the week emphasized the field of engineering as well as the research students and faculty members are conducting.